Passion is the driver for this community project that explores and maps the natural environment of NSW far south coast. The Atlas of Life in the Coastal Wilderness is an ambitious, long-term, community mapping project that seeks to identify as many of the region’s living creatures as possible. Key to its success is the combination of scientists, naturalists and members of the community working together. Participants are encouraged to record their observations of the natural world and to contribute this information to a database. Findings are then linked to other biodiversity surveys and also to the national Atlas of Living Australia database. The project spans the landscape from the Great Dividing Range in the west, to the coast of New South Wales south, from Bateman’s Marine Park and down to the northern coastal region of Victoria at Lakes Entrance. Merimbula resident Libby Hepburn founded this project with other biodiversity enthusiasts. She hopes that the Atlas of Life will eventually include observations made over time by many other special interest groups, including databases of flora observations, the 57 bird surveys already undertaken in the region and 20 years’ of koala surveys from the coast to the Alps. The project is also looking to include other historical data including observations gathered by the Panboola Wetlands Trust and records collected by the Bournda Environmental Education Centre. To encourage community participation, the Atlas of Life offers workshops and surveys led by professional scientists and expert local naturalists. 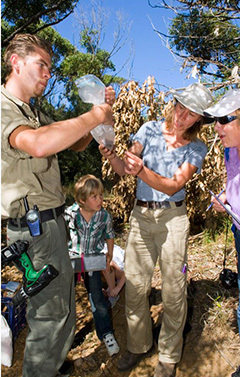 Training sessions help ‘citizen scientists’ become more proficient in observing and recording the presence of wildlife, promote accuracy and help contributors learn to recognise local flora and fauna and access other information about Australian plant and animal life. Libby has initiated other community projects to enhance awareness of coastal wilderness and to collect data so that the Atlas of Life becomes a significant source of regional biodiversity information. For example the 2012 Bermagui BioBlitz attracted participation from more than 60 school students from five regional schools who helped to identify animals and plants from beach, estuary and wetlands. There were night time scuba and snorkel searches led by local and visiting naturalists and scientists shared their expertise. Over a 30-hour period, more than nearly 300 people were engaged in 42 different surveys of all the living things that could be found, from cliff top plants, nocturnal marsupials and frogs to shell death assemblages. With new funds coming in from the 2013 NSW Regional Science Grants program, the Atlas of Life in the Coastal Wilderness project plans to develop an app to improve marine data collection in the area and to extend its Our Place biodiversity project. Libby’s desire to work with others to learn more about and protect a unique coastline is what inspires her to bring these ambitious projects to life, not to mention her passion for snorkeling.